I'm not certain when it happened, but somewhere along the line fall became a season to celebrate. Special drinks and foods to welcome the turning of the leaves while dressed in layers of scarves and cute boots. I can't tell you how happy I am because I don't just love fall for fall's sake, I was born in the fall so this time of year is worth celebrating! And, what makes a party a real party - the dip of course! For the last several years, I've spent Halloween bundled on my porch with a few close friends, drinking wine, grazing, and passing out candy while the kids go trick or treating with the hubs. 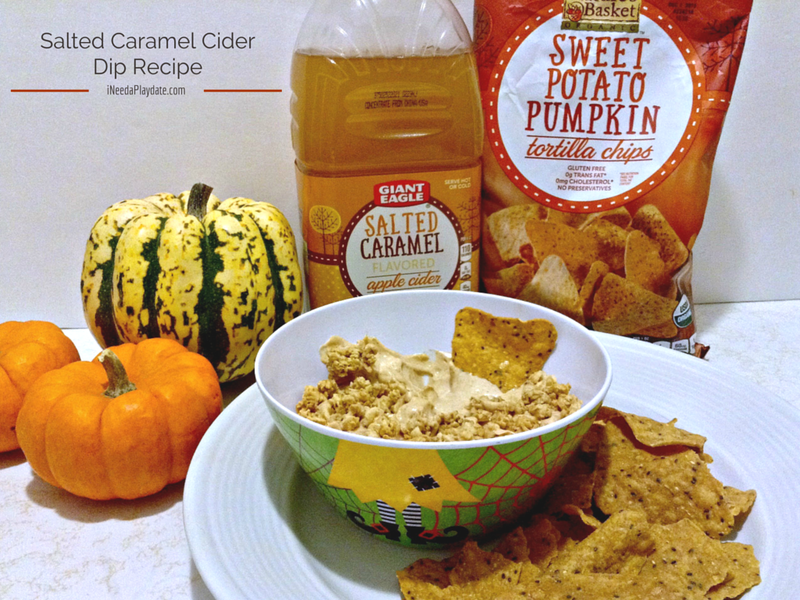 This year, I bringing a new dip to the table - Salted Caramel Cider Dip which was inspired by Giant Eagle's Flavors of Fall. We love our neighborhood Giant Eagle! And, by we I really do mean the whole family. We know the cashiers by name and they know us. Plus, it's so convenient having not just one but two Giant Eagles close to home so when we have to make that extra stop for something forgotten or just something we crave it's not out of our way. Racking up FuelPoints doesn't hurt either! 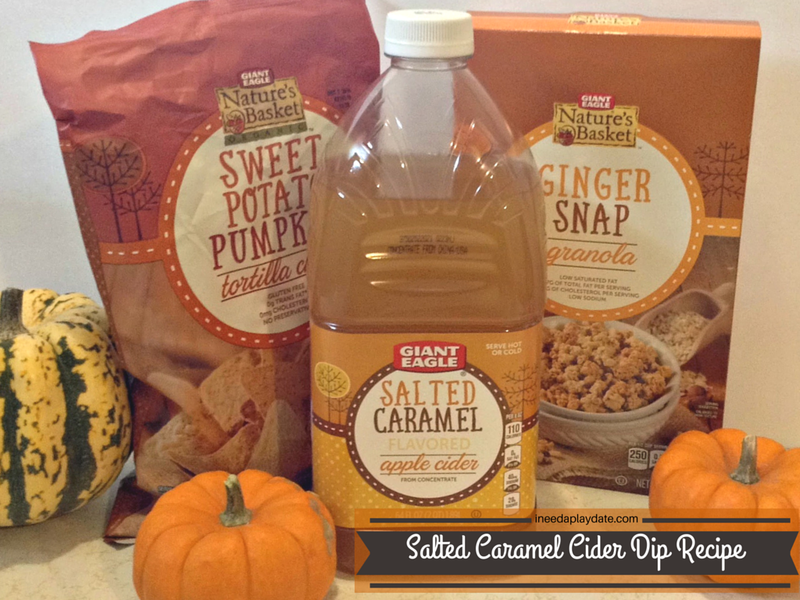 Giant Eagle's Flavors of Fall is their fresh new line of products that captures the wonderful tastes of the season like crisp apples, spicy ginger, and creamy pumpkin. Caramel is another flavor that goes naturally with fall. It pairs well with apples and is brilliant drizzled on pumpkin pie. As soon as I saw Salted Caramel Apple Cider and Sweet Potato Pumpkin tortilla chips I knew that they had to go together and thus was born this recipe. The hardest part of the recipe is waiting for the cider to condense, but while it was working I gathered the rest of the ingredients and read the little one a short book. This sweet dip is so easy to make that the little one helped me. I let her cream the cheese, and stir in the brown sugar. Once it was time for the cider, I poured as she blended. Besides helping to make this dip, I was surprised that both my kids liked it and they don't dip anything, not fries or nuggets, not even chips. This went wonderfully with the salty pumpkin tortilla chips, but also tastes great with apples, pears, and pretzels. 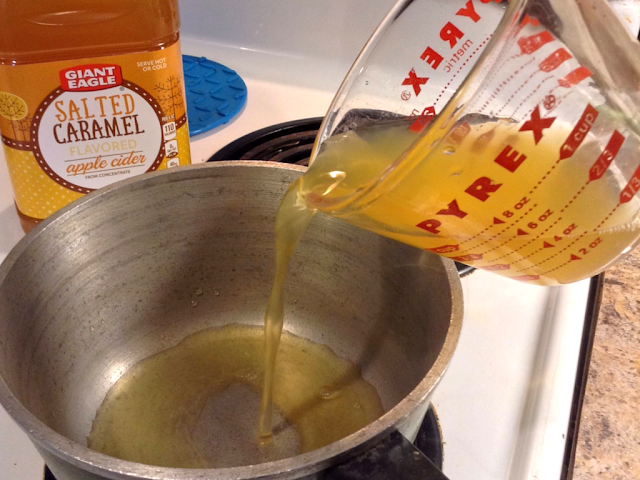 Bring Salted Caramel Apple Cider to a boil then reduce to medium heat until it is condensed to about 3/4 of a cup. Stir in vanilla, remove from stove and let cool. Blend cream cheese until creamy in a medium bowl. Starting with softened cream cheese helps. 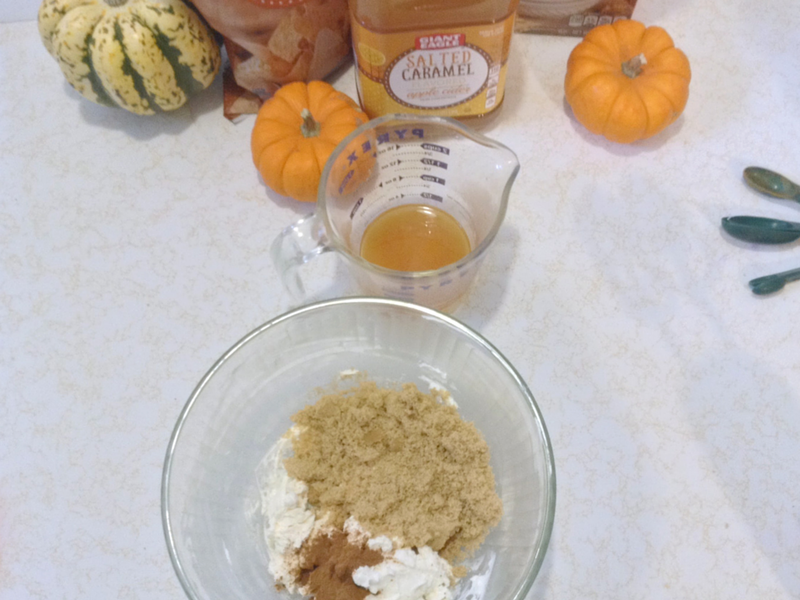 Add brown sugar and cinnamon to the cream cheese and blend until smooth. 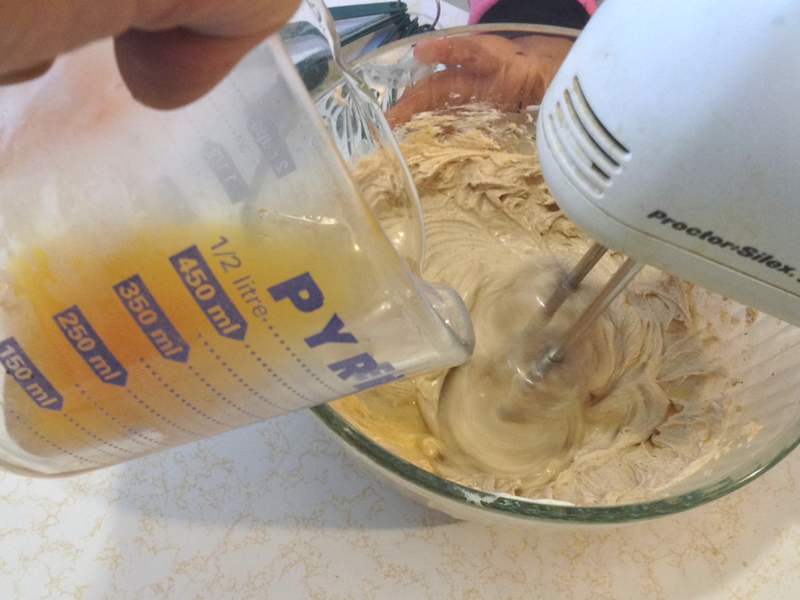 You want to make sure that the brown sugar is incorporated well so it won't taste grainy. Slowly pour in the condensed cider, stir until combined, and refrigerate for at least an hour. Top with Ginger Snap Granola and serve with Sweet Potato Pumpkin tortilla chips, fresh fruit, or Giant Eagle pretzels. What are some of your fall flavor favorites?